The last update of this item was more than 1 year ago. It will not be compatible with the latest version of WordPress. 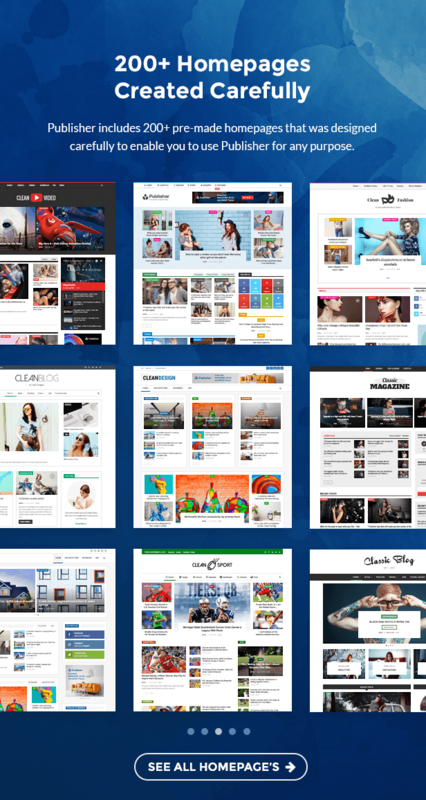 It does not matter if you want to create news website, online magazine or personal blog, review website Publisher offers limitless customization options, layouts and headers with an easy to use Admin Panel. 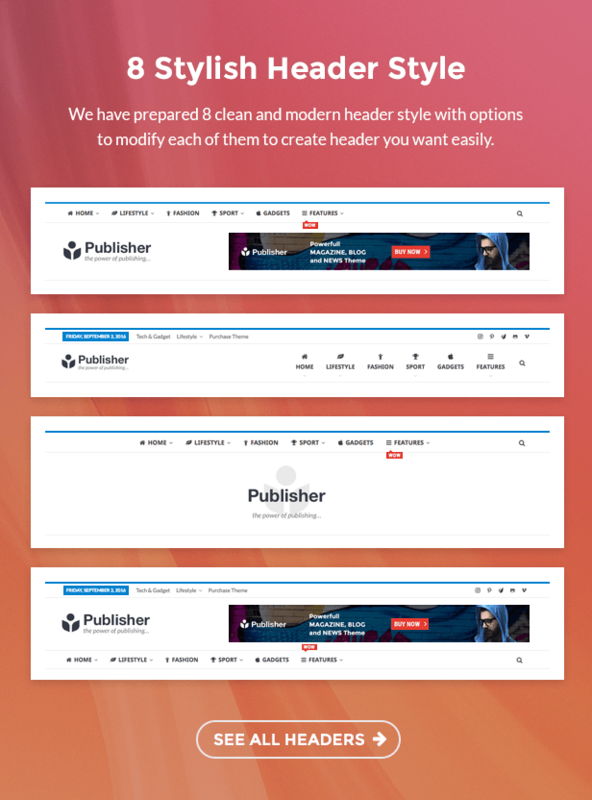 Publisher is the perfect combination of a beautiful and professional design with tons of powerful features and a bulletproof code base. Need to make money? Publisher includes advanced Ads Management system that enables you to add Adsense Ads , Google DFP Ads, HTML and Image ads easily with 100+ ad location. Publisher supports RTL style and RTL languages completely. Thousands of Arabic, Hebrew and Persian sites are using it in their magazine and news sites to publish contents and make money. Publisher is the best RTL supported theme that ever created. All aspects and sections of Publisher was developed with high programming skills to load faster with using smaller server usages! 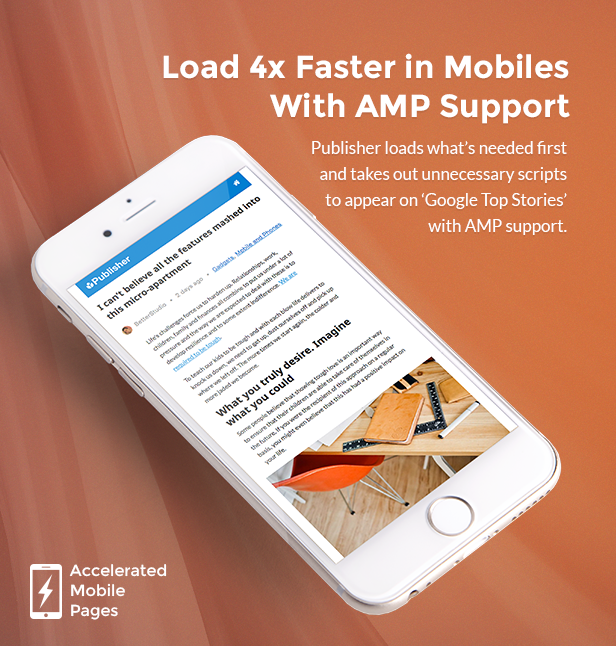 Also publisher support Google AMP with exclusive plugin that we developed and bundled inside theme to load 4x faster in mobiles. Publisher is fully responsive and will look perfect regardless of whether you’re using a huge desktop or a small phone. Desktops, iPads, iPhones, Android phones, doesn’t matter. Publisher will look great. Publisher comes with a lot of options that enables you to change any section of your site without need to change the codes! Also Publisher comes with panels like Translation Panel that you can use it to translate it in you language or Font Manager Panel that you can upload you custom fonts and use them. Google AMP Supported and validated. Real Responsive Design with a lot advanced options for widgets and menu items to hide/show them in specific devices! 9 Stylish Demo and more are coming soon. 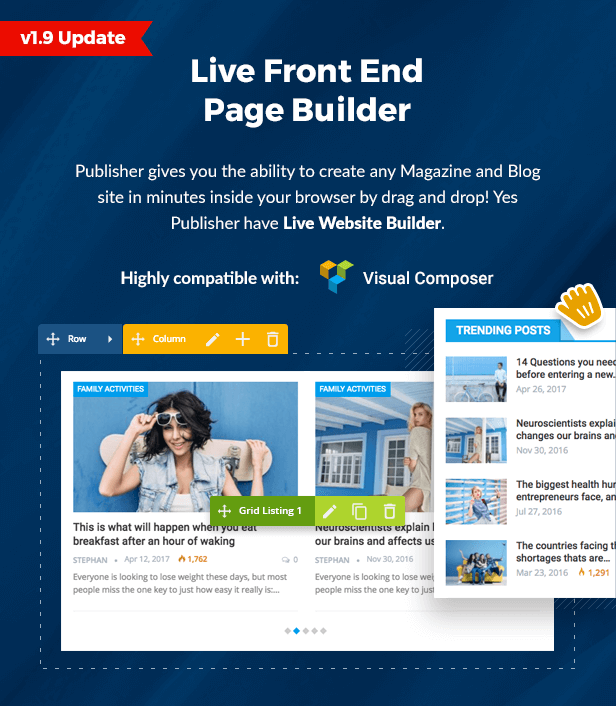 70+ Page Builder Blocks: Publisher is integrated with Visual Composer and added more than 80 blocks that you can built any layout you want! 15+ exclusive plugin included and can be updated by one click from our plugin installer panel. Advanced SEO Optimized: Rich snippets for breadcrumbs ,reviews and others are built-in. Further SEO enhancements available using Yoast SEO plugin. Visual Composer plugin Included and integrated. 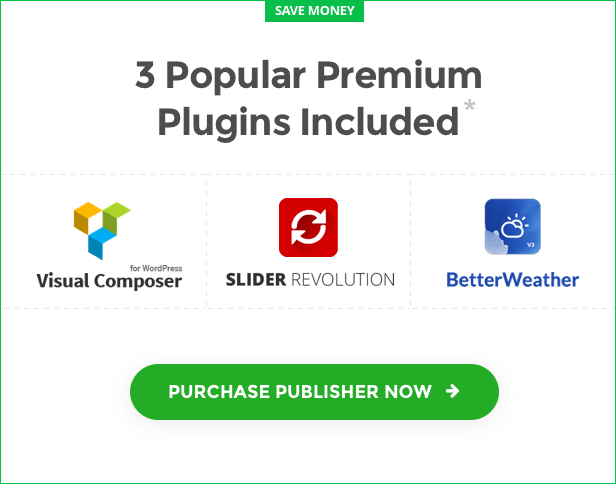 Slider Revolution plugin Included and integrated. Better Weather plugin Included and integrated. First WordPress theme with Gif thumbnail support..
3 Type of review: Star, Percent and point. Options to Show/Hide Each Widget in different devices like phone or tablet. Advanced and Simple use Theme Options Panel. 2 Column, Right Sidebar Layout. 2 Column, Left Sidebar Layout. 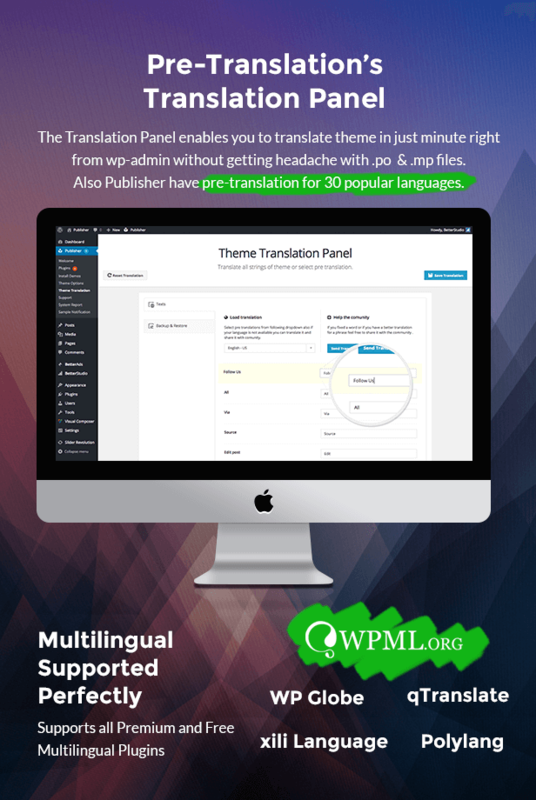 Multilingual Support: WPML, qTranslate, Xili Language, WPGlobe and Polylang supported! . Translation Panel with pre-translated options ( Currently translated to 24 popular languages!! ). Builtin Plugin installer and updater. Builtin panel to rebuild all thumbnails. Font Manager Panel: You can upload your custom fonts and select them for specific locations. there is no limitation for number of fonts. 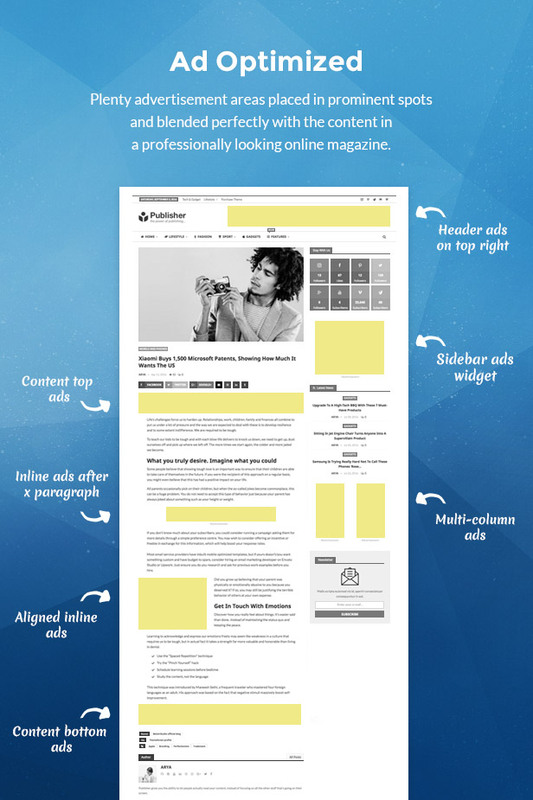 Advanced Ads Support: Comes width our Better Ads Manager plugin that ads advanced Ads feature to your site with support of Google Adsense ( Responsive also ) and AdBlocker detectors. Exclusive field for Featured image credit..
Posts Source and Via fields..
Smart Sticky Menu: Publisher equipped with beautiful mega menus. you can either use simple drop down menus, or use one of 6 styles of mega menu. Sticky Sidebars” The Sidebar moves automatically when you scroll down page and it will be visible always! also you can disable this feature. High Speed Code: Publisher performs as a beautifully as it looks with consistent, bloat-free code and a solid framework. WAI-ARIA Supported: Publisher includes WAI-ARIA roles through all of our templates, ensuring your site conforms to the latest accessibility standards set forth by the W3C. Font Awesome Icons: Get creative with Font Awesome icon support. Publisher includes an unique icon select tool that you can search and find Font Awesome icons simply with typing and selecting from categories. Custom Post Types & Taxonomies: We added some options to use custom post types inside theme without need to coding! life Time Free Updates: Publisher is always up to date. We always listed our customers needs & reports and each week we added many new features and fixes! Auto-Updates: Don’t waste anymore time updating! 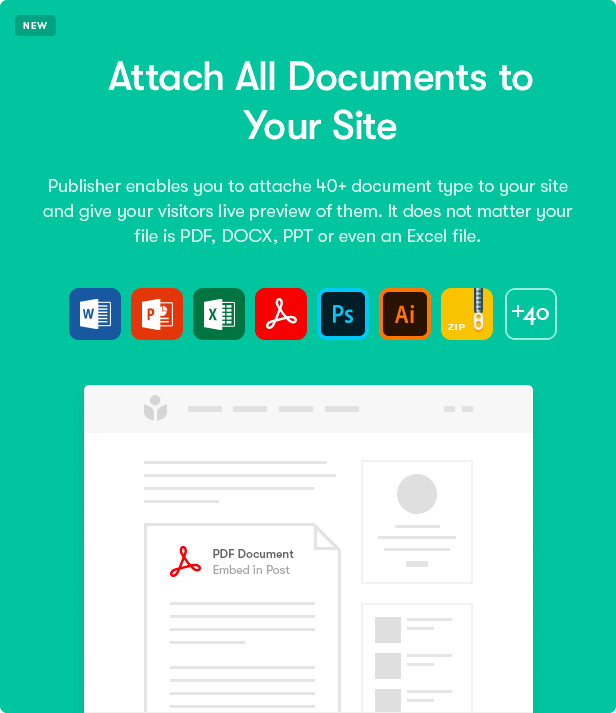 Publisher can update itself automatically. - Added: Injection locations disable feature for posts added. - Added: Injection locations disable feature for categories added. - Added: Option to change ad captions to below or above ads. - Added: Option to show author posts count in his profile. - Added: Option to set custom post types for search page in theme panel. - Added: Youtube videos related videos will be removed in the embeds. - Added: Custom logo option for posts. - Added: Custom header style option for posts. - Added: Custom menu option for posts. - Added: Custom header bg color and image option for posts. - Added: Footer disable option for posts. - Added: Custom positions for Facebook chat added. - Added: RTL Support added to Financial Pack. - Improved: Blocks custom heading color improved. - Improved: "Music News" demo style improved. - Improved: "Financial News" demo style improved. - Improved: "World News" demo style improved. - Improved: Facebook Instant Article compatibility improved. - Improved: don't print duplicate js file for Google AdSense. - Improved: Facebook chat codes improved. - Improved: Newsletter pack codes improved. - Improved: Financial Pack codes improved. - Fixed: Gif images are not showing. - Fixed: Post template 14 featured image is not showing. - Fixed: Wrong eye icon on share count in posts. - Fixed: Page horizontal scroll in some demos. - Fixed: Theme links color not works inside WP Bakery Page builder text add-on. - Fixed: Gamers demo scroll issue. - Fixed: Pinterest not works in social counter. - Fixed: Linkedin wrong link in social counter. - Devs: "publisher/page-layout-settings" filter added. - Devs: "publisher/page-layout" filter added. - Fixed: Section heading 34 style issue. - Fixed: Push notification translation added to translation panel. - Fixed: Multiple post type support for non-static homepage. - Fixed: Google Play issue about texts. - Fixed: Reviews JSON-LD fixed. - Fixed: Wrong items count on the smart lists. - "ACF Pro" plugin added. - "Ultimate Addons" plugin added. - "Total Poll Pro" plugin added. - "Convert Plus Popup" plugin added. - "Financial Pack Pro" plugin added. - "Better Facebook Chat" plugin added. - "Theia Smart Thumbnails" plugin added. - "Real3D FlipBook" plugin added. 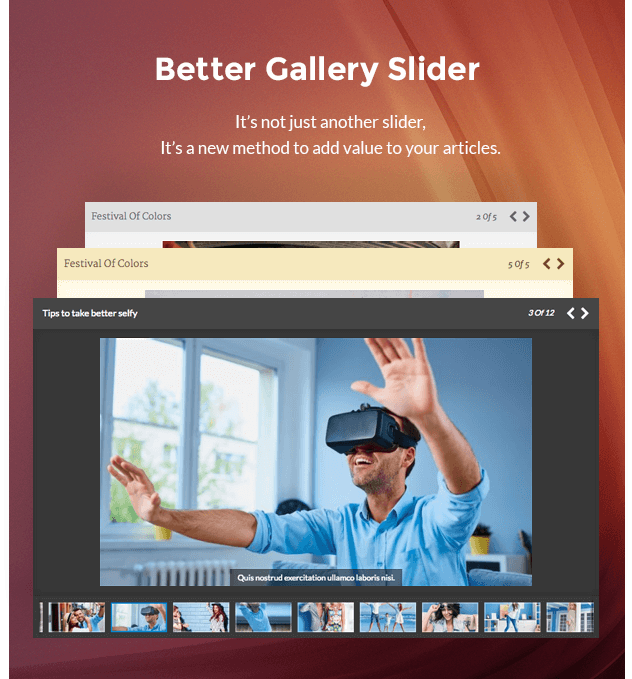 - "Master Slider" plugin added. - "Better WP Embedder" plugin added. - Added: Financial Pack Plugin: Complete solution for financial widgets. - Added: Currency (money) Widgets. - Added: 110+ new widget for Financial Pack! - Added: 27 Cryptocurrency widgets. - Added: 2 Cryptocurrency Events table widgets. - Added: 5 Cryptocurrency table widgets. - Added: 6 Cryptocurrency Converter widgets. - Added: 27 Stock-market widgets. - Added: 5 Stock-market table widgets. - Added: 6 Stock-market Converter widgets. - Added: 27 Currency widgets. - Added: 5 Currency table widgets. - Added: 6 Currency Converter widgets. - Added: Columned and Marquee style for all widgets. - Added: Translation panel for Financial Pack. 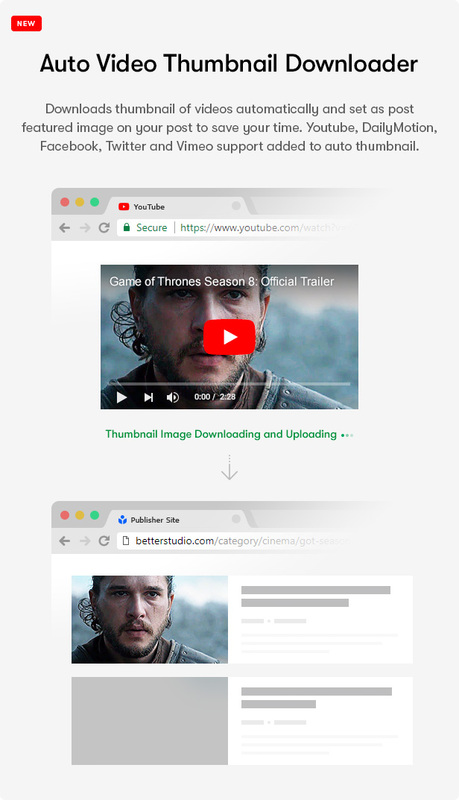 - Added: Auto download video and set as thumbnail feature added. - Added: Youtube, DailyMotion, Facebook, Twitter and Vimeo support added to auto thumbnail. 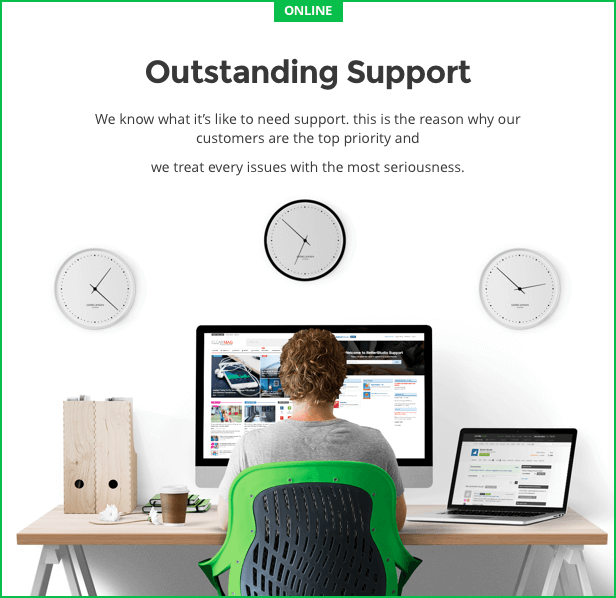 - Supports multiple activate, update and deactivate. - Core compatible codes to work on all WP installation. - Added: Push notification support added (Publisher -> Theme Options -> Push Notification). - Added: 2 Widget for adding Push notification subscription in sidebars added. - Added: 2 push notification subscription location for post added. - Added: Option to show aside logo ad in mobile. - Added: Option to show aside logo before mobile header or after. - Added: Better WP Embedder Plugin added. It helps you to embed (add) all following files to your posts. - Added: Google Drive support to "Better WP Embedder"
- Added: DropBox support to "Better WP Embedder"
- Added: Facebook chat plugin added to add the FB Messenger inside your site. 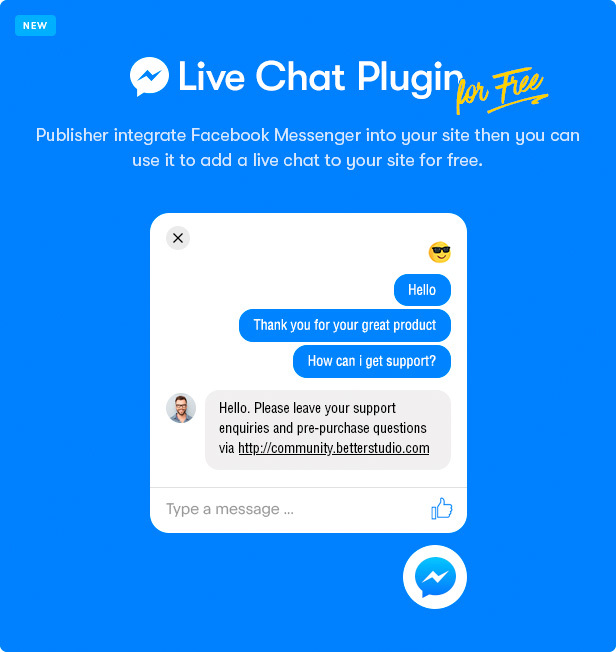 It adds live chat on your site for free! - Added: 5 New Blockquote style added. 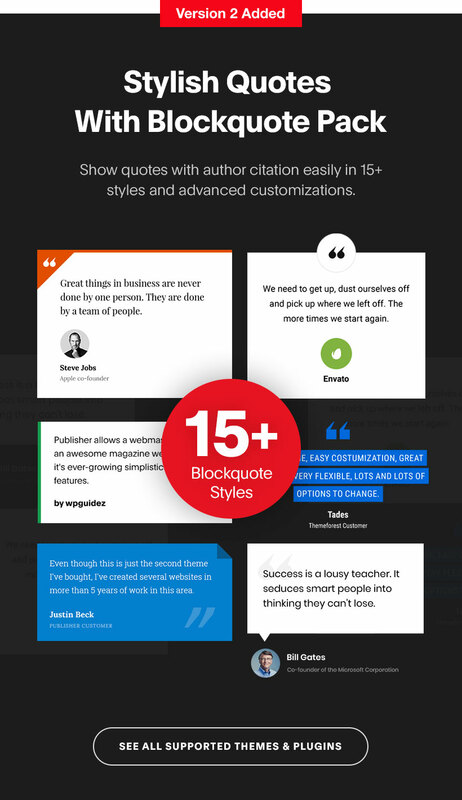 - Added: Blockquote style 19 added. - Added: Blockquote style 20 added. - Added: Blockquote style 21 added. - Added: Blockquote style 22 added. - Added: Blockquote style 23 added. 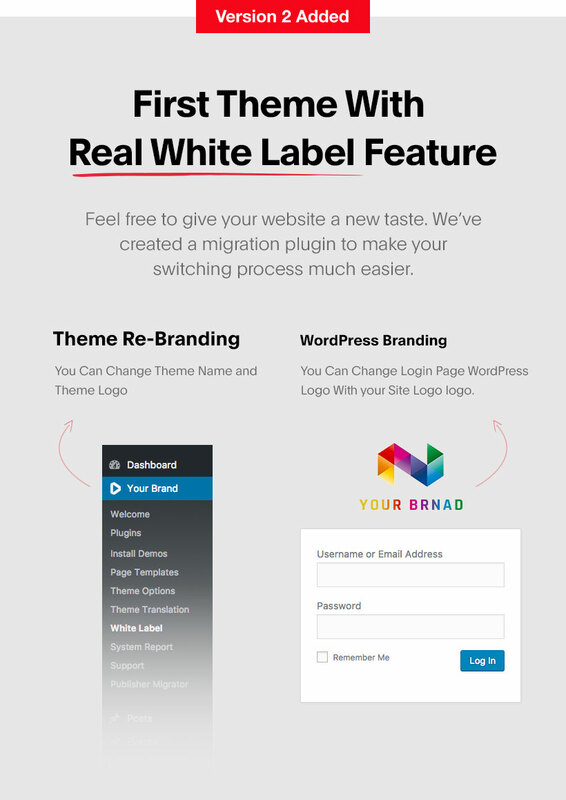 - Added: 30+ new Theme & Plugin support added to Publisher Migrator. - Added: Section heading style 39 added. - Added: The auto support for renamed folders of Publisher. - Added: Option to upload SVG as the logo. - Added: Force RTL style for Visual Composer added. It helps you create a perfect responsive site with Visual Composer in RTL direction. - Added: Meta & Excerpt support small items of "Mix 2". - Added: Meta & Excerpt support small items of "Mix 4". - Added: Meta & Excerpt support small items of "Mix 8". - Added: New option to set a custom color for footer top line. - Added: New option to set a custom BG Color for Footer Menu. - Added: Advanced heading options support added to Newsletter Pack widget. - Improved: Migrator support of taxonomy meta improved. - Improved: Customizer transformer can be overridden in the child theme. - Improved: AMP Auto content validator improved. - Improved: AMP Video will be shown on single if the post format was video! - Improved: AMP Codes improved. - Improved: Google Custom Search codes improved. - Improved: Ads manager codes improved. - Improved: Better Playlists code improved. - Improved: Post views codes improved. - Improved: Reviews codes improved. - Improved: Blockquote styles improved. - Improved: Blockquote codes improved. - Improved: Smart lists code improved. - Improved: Migrator admin UI improved. - Improved: Migrator codes improved. - Improved: Page templates improved. - Improved: "Market News" demo style improved. - Improved: "Wonderful" demo style improved. - Improved: "Tech Magazine" demo style improved. - Improved: "Better Mag" demo style improved. - Improved: "Business Times" demo style improved. - Improved: "Celebrity News" demo style improved. 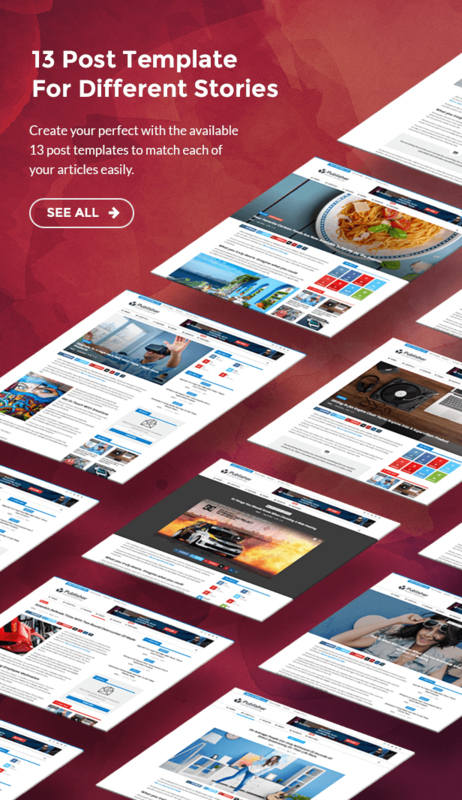 - Improved: "Online Magazine" demo style improved. - Improved: "Newspaper" demo style improved. - Improved: "The Online Post" demo style improved. - Fixed: Conditional fields are not working properly in menus page. - Fixed: Post custom class does not work on single pages. - Fixed: Bug in the tabs id section when editing by our live TinyMCE builder. - Fixed: Extra items in horizontal menus. - Fixed: ThemeCheck.org warnings fixed. - Fixed: Heading style 33 styles in widgets fixed. - Fixed: German translation issues fixed. - Fixed: Login popup style issue in Clean Design & Classic Mag fixed. - Fixed: SEO improved for contents in the injection locations. - Fixed: WooCommerce outdated template file fixed. - Fixed: Section Heading 13 background issue on widgets fixed. - Fixed: 3 column layout issue on tablets. - Fixed: Instagram new API change support added. - Fixed: Facebook Instant Articles validation issue fixed. - Fixed: Smart lists and Injection location conflict. - Fixed: Fixed: Products shortcode prints extra tag close. - Fixed: Mobile header logo vertically align issue. - Fixed: Footer social icons extra space. - Fixed: BetterMag and some other themes issue in right scroll in mobile. - Added: 11 New demo added. 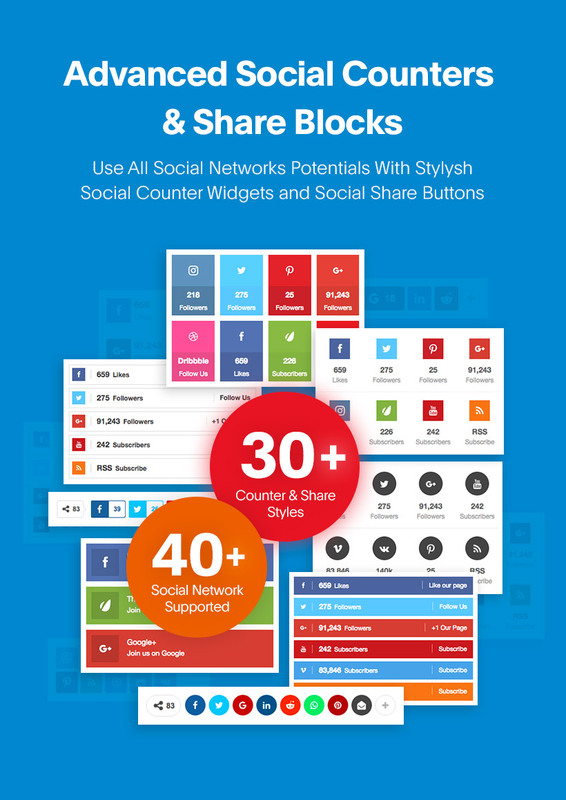 - Added: Unlimited Custom Social Share links feature added. - Added: "Injection Location" feature added. 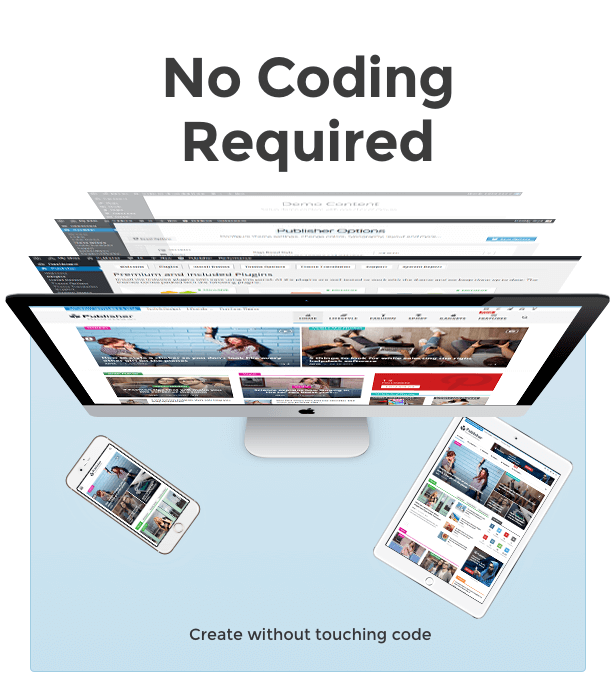 The first theme with ability to add pages content to different locations of theme without need to change the theme codes. - Added: Today Readable time for blocks date. - Added: Last 7 day Readable time for blocks date. - Added: Last 30 day Readable time for blocks date. - Added: Option to select widgets heading for all footer widgets. - Added: Section heading style 38 added. - Improved: Print and email texts added to Translation panel. - Improved: Blog listing 5 responsive style improved. - Improved: White Label panel improved for live change of theme panel link in menu. - Improved: FIA compatibility improved. - Improved: Smart After X Posts Ads location for ajax pagination. - Improved: FIA transformer roles can be override in child theme. - Improved: Plugin installer process improved. - Improved: Icon fonts updated. - Improved: Image ads can be without links. - Improved: AMP Yoast SEO plugin compatibility improved. - Improved: Blockquote Pack RTL style improved. - Improved: Google Custom Search plugin created from scratch to updated to Google API update. "Custom Search Element Control API v2"
- Added: OK.ru added to social share buttons. - Improved: 5px padding for left and right of boxed layout added. - Added: 10 new demo added. - Added: Section heading style 35. - Added: Section heading style 36. - Added: Section heading style 37. - Added: Typography option for widgets heading style. - Added: Light color scheme for all blocks. - Added: Out of box layouts added to header. - Added: Box layout and out of box layouts added to footer. - Added: Checkbox to set vc column as sticky in sidebar columns. - Added: Checkbox to set vc column as a theme widget sidebar. - Added: Widget support for Box 1-4 blocks. - Added: Background Image & Color 2 option added. - Added: Option to show/hide feature image of Pages. - Added: Design options added to slider 1, 2 and 3. - Added: 38 new Google fonts support added (Google Fonts updated). - Added: System font added to font stacks. - Added: "Page" post type support added to Smart Lists. - Improved: Visual Composer filled and stretched rows will be fast (js level removed). - Improved: Footer widgets responsive style improved. - Improved: No Duplicate posts will be disabled for author posts inside related posts box of post. - Improved: User site link in author profile page. - Improved: AMP "WPO Tweaks" plugin compatibility. - Improved: Social counter style improved. - Improved: Social counter code improved. - Improved: Smart list will detect content before the list automatically. - Improved: AMP compatibility for reviews. - Improved: Dark Mag style improved. - Improved: Floated blockquotes style. - Improved: AMP video style improved. - Devs. 'better-ads/shortcode/live-preview' added to disable ad shortcode live preview. 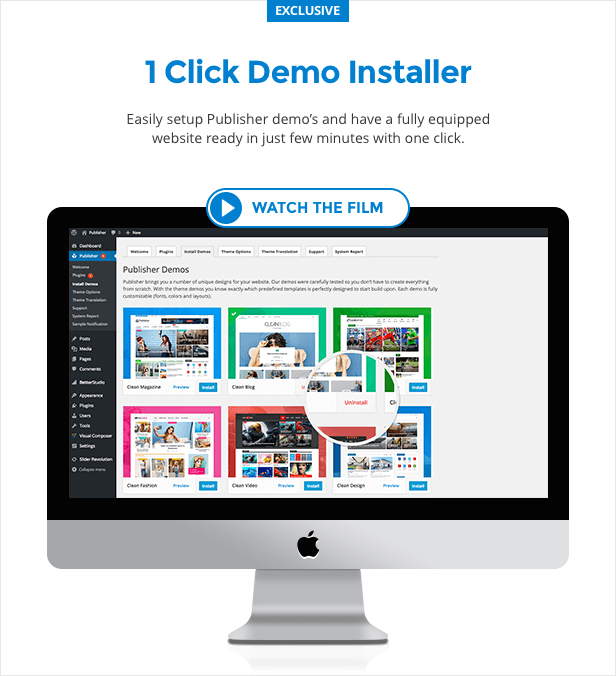 - Added: Publisher Migrator (Switcher) plugin added. 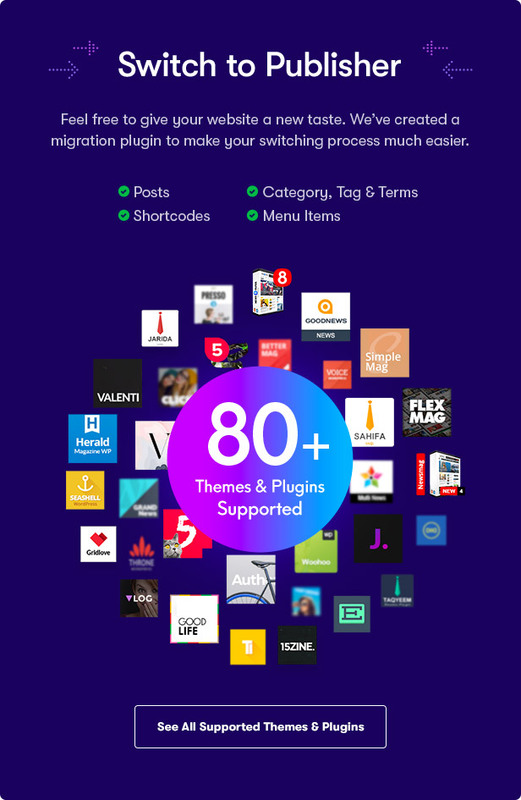 - Added: 50+ popular themes & plugins support added to Publisher migrator. 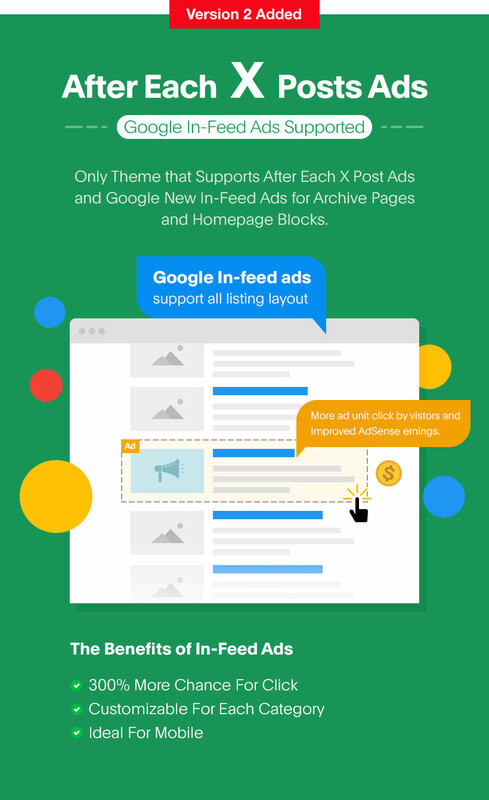 - Added: New Google "In Feed" ads support added. - Added: New Google "Matched Content" ads support added. - Added: New Google "In Article" ads support added. - Added: AMP "Google Auto Ad" compatibility added. - Added: "After X Posts" ad added for archive page. - Added: "After X Posts" ad feature added for all block listings (in VC settings). - Added: Ads shortcode text added to banners archive page. - Added: Auto redirect to AMP for mobile visitors added (compatible with all cache plugins). - Added: AMP - New fields for adding custom code in the head, body start and end of the page. - Added: AMP favicon support added. - Added: AMP - Option to enable/disable header sticky feature. 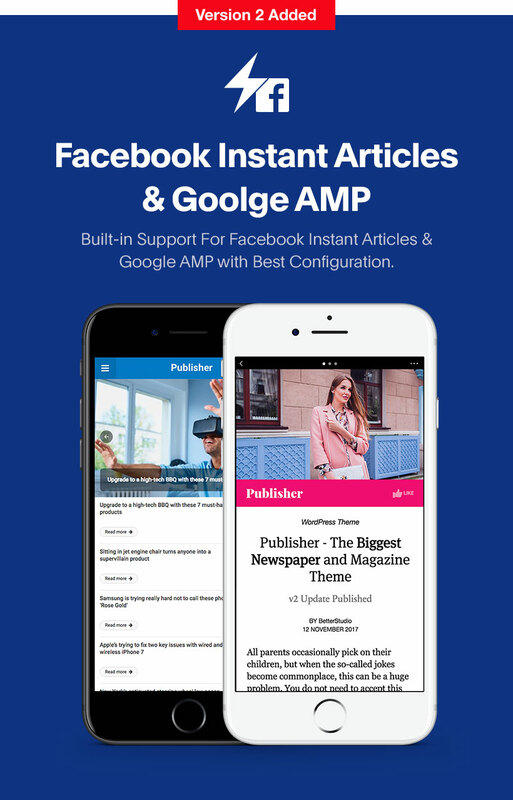 - Added: Built-in Facebook Instant Articles compatibility & plugin added. - Added: Smart Lists Pack plugin added. 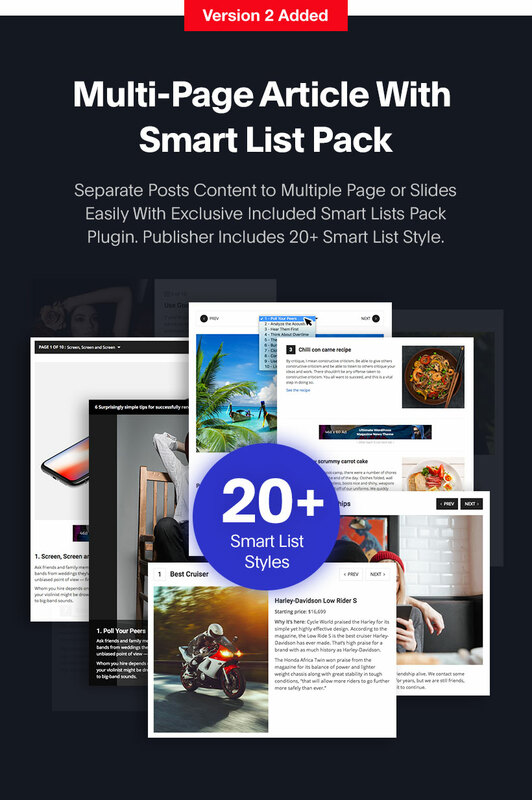 - Added: 20 Smart list style added. - Added: AMP support added to all smart list styles. - Added: Option to set default smart list style on site. - Added: Blockquote Pack plugin added. - Added: 17 advanced blockquote style added. - Added: Blockquote shortcode with options author avatar, author name, job title and link (live shortcode). - Added: AMP support added for all blockquote styles. - Added: Option to set default quote style on site. - Added: Newsletter Pack plugin added. - Added: 11 Newsletter style added. - Added: 10 Newsletter form location added (includes after x paragraph newsletter). - Added: "aWeber" newsletter forms support added. - Added: "Mailer Lite" newsletter forms support added. - Added: White Label = Option to limit "White Label" panel to a specific user. - Added: Option to use category settings (logo...) for all posts of a category. - Added: option to show resized or full version of the featured image in post. - Added: Meta box for each single forums added. - Added: Option to override page layout in single forums added. - Added: Option to show/hide "Dot Controls" in Slider 1, 2 and 3. - Added: Option to change count of subcategories in tabbed mega menu. - Added: Option to change order of subcategories in tabbed mega menu. - Added: Custom Tab ID support added. 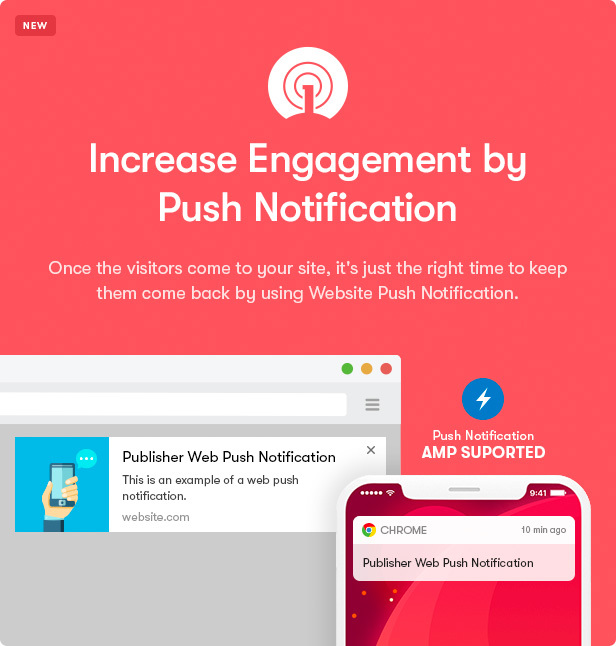 - Added: Full WPML support added to AMP. - Added: Option for adding thumbnail to RSS. - Added: Page builder option for mega menus added. - Devs: better-amp/template/body/start action added. - Added: Option to disable share buttons (+) button. - Improved: RTL style improved and fixed. - Improved: "Clean Tech" and "Clean Design" demos improved. - Improved: Ad locations can define AdSense ad size to make them smarter. Used in Skyscraper and will be used in future advanced ad locations. - Improved: BetterAds will detect AdSense ad size from the style. - Improved: BS Booster support for Social Counter. - Improved: BS Booster support for Better Playlist added. - Improved: Skyscraper sticky functionality improved. - Improved: BS Booster cache will be cleared automatically after theme update. - Improved: AMP WooCommerce outdated functions updated. - Big Improvement: Late responsive removed and responsive design improved (we rewrite CSS codes of blocks again from scratch!). - Added: Development domain option added for a license. - Added: Option to customize "Heading Style" for each block & widget added. - Added: Option to customize "Heading Color" for each block heading added. - Added: Dark style for Off-Canvas menu added. - SEO Optimized: A lot of SEO Optimization for all pages of the theme. - Post headings improved. Only post heading tags on the single page. - Meta tags improved and fixed for SEO optimization. - Article tags in single pages fixed and improved. - Added: 3 pre-made templates for "Our Contributors" pages added. - Redesigned: Mobile Header redesigned completely. - Added: Topbar menu will be shown in the mobile header. - Added: 8 Gradient background variant added for Mobile Header. - Added: Custom background color option added for Mobile Header. - Added: Background Image option added for Mobile Header. - Redesigned: Lazy loading effect redesigned. - Added: 7 new Review box style added. - Added: Pros & Cons added to Reviews. - Added: Affiliate options added to Reviews. - Added: Visitors rating added to Reviews. - Added: Custom icon and color style for review criteria added. - Added: Comments will be shown in AMP. - Added: AMP Option to change share links to short/normal link. 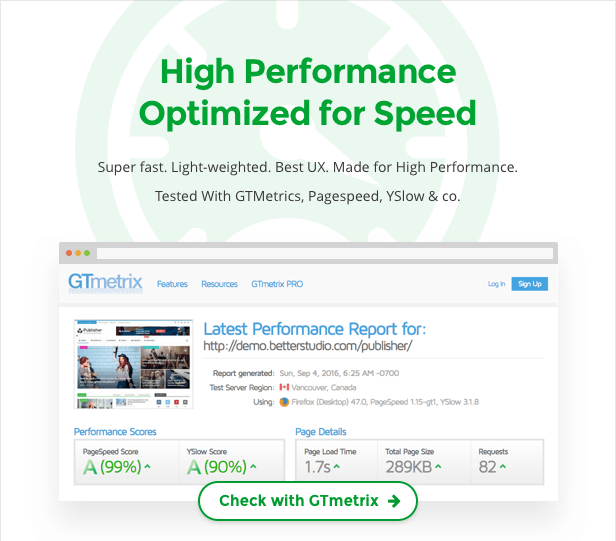 - Added: AMP "WP Speed Grades" plugin compatibility added. - Added: AMP CSS validator added for custom CSS and element CSS! - Added: AMP "WP-Optimize" plugin compatibility. - Added: AMP "Speed Booster Pack" plugin compatibility. - Added: Pagination support for AMP Comments added. - Added: Print button added to post share buttons. - Added: Option to select different share buttons style for post Top and Bottom added. - Added: Linkedin added to the social counter. - Added: ok.ru added to the social counter. - Added: SnapChat added to the social counter. - Added: Tumblr added to the social counter. - Added: BS Booster panel added. - Added: BS Booster option to enable/disable CSS and js minify added. - Added: BS Booster option to purge all caches added. - Added: Widgets and Menu cache support added to BS Booster. - Added: BS Booster shortcodes cache support added. - Added: Advanced a Live shortcode editor added for Tabs and Accordion shortcode. We will add support for this editor for other shortcodes in next updates. - Added: Left and Right Skyscraper ad location added! It's the best skyscraper ever created! - Added: Option to enable/disable the Skyscraper banners sticky feature. - Added: Option to move Skyscraper to after header + it's smart and detects page layout changes!. - Added: "After related posts" ad location added. - Added: "Before Header" ad location added. - Added: "After Footer" ad location added. - Added: Smart sub menu direction added. Will detect the corners of the page to show sub menus in the left or right side. - Added: Delay for menu disappear added to improve the usability of menus. - Added: Option to disable duplicate posts on that block added. 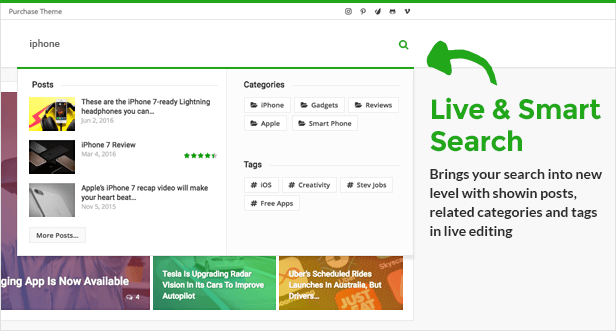 - Added: New related posts algorithm options added: "Selected Category", "Selected Tag" and "Selected Post IDs"
- Added: Site top line will be shown in all sticky headers. - Added: Close button added to Off-Canvas. - Added: Complete bbPress support added to the breadcrumb. - Added: 2 & 1 Column footer widget area added. - Added: Print mode style added. - Added: "publisher/header/after" added (for devs). - Added: Option to show/hide login form in the mobile header. - Added: Option to show/hide search form in the mobile header. - Added: Option to show/hide Topbar navigation in the mobile header. - Added: Option to show/hide social icons in the mobile header. - Added: "5 Column Links" mega menu added. - Added for Devs: "publisher/content-wrap/before" action. - Added for Devs: "publisher/content-wrap/start" action. - Added for Devs: "publisher/content-wrap/end" action. - Added for Devs: "publisher/content-wrap/after" action. - Added for Devs: "publisher/main-wrap/before" action. - Added for Devs: "publisher/main-wrap/start" action. - Added for Devs: "publisher/main-wrap/end" action. - Added for Devs: "publisher/main-wrap/after" action. A score calculated by Google Pagespeed Insights - testing various aspects against best practice. A bad value is not necessarily a general elimination criterion as there will be a lot of space for improvements. A score calculated by Yahoo - testing various aspects against best practice. Load time should be as fast as possible ( less than 3 seconds ) - every additional second will cost you visitors and google ranking. Try to keep the number of requests small ( less than 50 ) - combine files / remove plugins to reduce the number of requests. Page size should be as small as possible ( less than 3 MB ) - optimize images and minify files to reduce the page weight. Looking for themes by author "Better-Studio"
Disclosure: This page contains external affiliate links. If you purchase a product through one of these links we may receive a commission. We do not receive any money for positive reviews or positive performance tests.